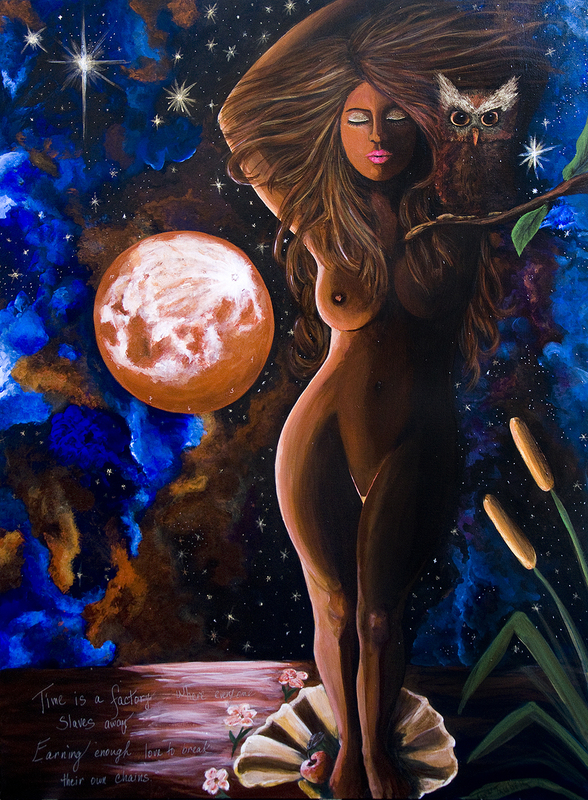 Art, take 2: "Eve's Liberation"
You've seen this piece before under a different title. I completed it last October but there have always been a couple elements I didn't fully like after I posted it and meant to change them but never did, in part because I was too scared to and in part because I was lazy, the latter probably driven by the former. Recently an artist call for a local show, "Faith", came up and I felt strongly that this piece represented everything I could roll up into the word "faith" and decided to submit it. However, those elements had to be changed before I could; I had to - pardon - have faith in that I could make the necessary changes without messing up the original somehow, because that's what happens when we do these afterthought touch-ups. I'm happy to report that I didn't screw it up and in my mind, made this piece better. The original quote in the painting, while really great and powerful, didn't belong even when I felt it did at the time I did it and I think this piece is perfect on its own now without it. To read about the making of this piece and it's meaning - which is my core platform for my life, my art, my existence - please view my original post on it. I changed the name of this art piece from the original too, as mentioned. We can have a long conversation about the original name choice if you want to but simply, "Eve's Liberation" is much more approachable to the audience who conflicts associating Latin root words with their gynecologist no matter how hard I try to explain the original title's logical origins. Sometimes an idea just doesn't catch on...i get it.